A Meet n' Greet with the Peanuts Gang, including Snoopy! Knott’s Berry Farm is a Southern California classic theme park that offers a little bit of everything for all ages. My preschooler adores the rides in the Camp Snoopy area. My tweens and husband love the roller coasters. I like the historical aspects, including the Ghost Town. And we all love the boysenberry treats, of course! After all, that’s how Knott’s Berry Farm began, back in the 1930’s on Walter and Cordelia Knott’s berry farm. I’ve visited Knott’s Berry Farm ever since I was a child and have recently rediscovered it with my own children. 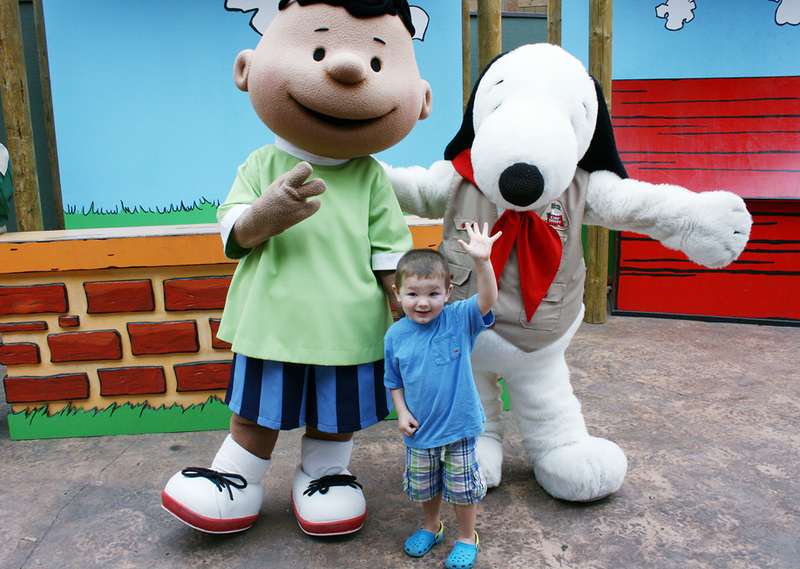 We always start our day at Camp Snoopy, a six acre area specifically for the littlest visitors. I enjoy the lush, woodsy feel in this area of the park. morning we visited, they seemed understaffed. Though parents can ride with their children on most of the rides in this area, some of the vehicles (namely Pig Pen’s Mud Buggies and Rocky Mountain Trucking Company) are so tiny that they will only fit the most petite adults. Find out more on how to work the busy Camp Snoopy area into your day. The Timber Mountain Log Ride, Butterfield Stagecoach and Calico Mine Ride are some of our favorite family rides. The Calico Mine Ride in particular is beautifully designed and amazingly detailed. We always enjoy the Ghost Town area where we watch the blacksmith making horseshoes. The entertainment at Knott’s Berry Farm is great but a few of the show spaces are in need of improvement. We watched Krazy Kirk and the Hillbillies on our last visit and while the show was great (we loved them when they were performing as Billy Hill and the Hillbillies at Disneyland), the Birdcage Theater was stifling hot and there was no air or fans whatsoever. The Calico Saloon Show was also a lively show but again, no air inside and a serious lack of chairs. We really loved the special-effects show at the Mystery Lodge with its mystical Native American theme. My big kids can’t get enough of the coasters! Nearly every area of the park has a coaster whizzing by overhead (which can be unnerving at times). My kids and husband ride the Sierra Sidewinder, Boomerang and XCelerator…and I watch and take pictures safely on the ground! Knott’s Berry Farm’s rich history is well-loved: from the humble beginnings of their farm, the development of the boysenberry, Mrs. Knott’s Chicken Dinner restaurant, and the subsequent amusement park. Walter Knott brought in buildings from deserted ghost towns. Many of these buildings still stand in the park today. Guests can experience history themselves by learning how to pan for gold or by visiting the Old Schoolhouse. Meals made for two (or more!) 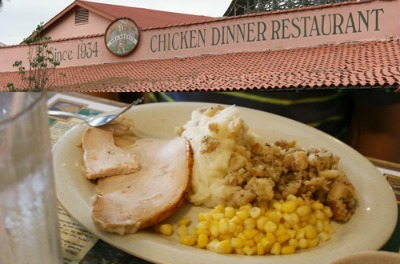 at Mrs Knott’s Chicken Dinner Restaurant. fried chicken is perfectly flavored and crispy. The biscuits are buttery and flaky. Just make sure you save room for boysenberry pie because it’s incredible! Trying eating at an “off time” because this restaurant often has a line out the door (and around the corner). 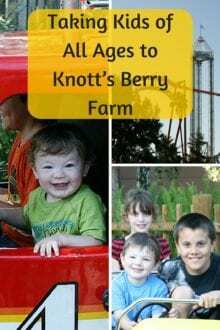 Knott’s Berry Farm is just a few miles down the road from Disneyland and definitely worth the day trip. It’s a unique and entertaining place all on its own, with offerings for all ages. Consider purchasing your Knott’s Berry Farm tickets ahead of time at a discount on Undercover Tourist. 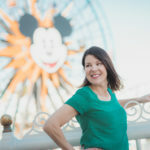 Yes Linda, Knott’s is only a few minutes drive from Disneyland so they are very close. I love the incorporation of the Peanuts Gang at Knott’s, especially the Camp Snoopy area of course. And yes, the boysenberry pie (and jam, and juice) are not to be missed!